Dilwara Temples : This complex consisting of five marble Jain temples is one of the finest in Rajasthan, worth braving the queues and ferocious guards. These beautifully carved temples built between 11th & 13th century AD are sheer elegance in marble, dedicated to the Jain Tirthankaras. The Vimal Vasahi Temple is the oldest of these, dedicated to the first Tirthankara. Built in 1031 AD (by Vimal Shah- a merchant and representative of the then Gujarat ruler), it is a superb example of temple architecture. Gaumukh Temple : Dedicated to Rama, this small temple (the cows mouth) is centred on a spring gushing from the mouth of a marble cow. In the Hindu creation myth, the world is formed by a cow, licking salt; the source of the Ganges has the same name. This is said to be the site of the ancient 'agnikund' fire rituals. It is 4 kms south of Mount Abu. Open, free access, down 700 very steep steps. 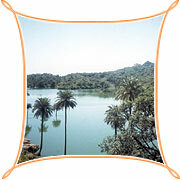 Nakki Talav : This holiday centre of Mount Abu, is virtually in the heart of the town. This sparkling blue artificial lake is said to have been gauged from the earth by the gods, using their fingernails ('nakh' means nail). Nearby is the 14th century Raghunath Temple.On the western edge of the town centre, Nakki Lake Road circles the entire lake. Rowing boats are available for hire from the jetty by Gandhi Park. View Points : Several points around the edge of the plateau offer spectacular views across the plains. The best are Honeymoon Point (Anadra Point) and Sunset Point, where hundred of people gather to watch the sunset every evening in a carnival atmosphere of pony rides and souvenir sellers. Baylays Walk is a pleasant 5 km route from Nakki Lake to Sunset Point. Honeymoon Point, 2.5 kms northwest on Ganesh Road; Sunset Point, 2 km southwest on Sunset Point Road. Open, free access. 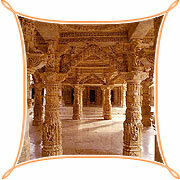 Air : The nearest airport to Mount Abu is Maharana Pratap Udaipur Airport, Dabok (Udaipur) 207-km. One can hire a taxi to get to Mount Abu. Rail : The nearest railway station is Abu Road (29-km) situated on Mumbai-Ahmedabad-Ajmer-Jaipur-Delhi route. From Abu Road one can take a taxi, jeep or bus to Mount Abu. Road : Ahmedabad is 222-km via Palanpur. Jodhpur is 235-km via Sirohi and Pali. Udaipur is 156-km via Pidwara. (Journey on this route is advisable only during the day). Jaipur is 509-km via Pali-Ajmer. It is connected to all the major towns in northern and western India.